I'm playing with the new In Colors. Tomorrow is the day the new catty goes live! I'm gonna put my order in as soon as I can. 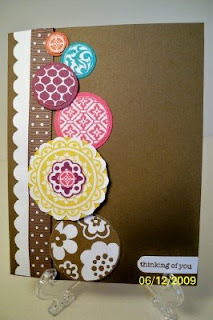 I'm not getting many stamp sets but will stock up on the new colors and the cute new ribbons. I'm a sucker for embellishments. Here's the link to a fun site with great challenges. 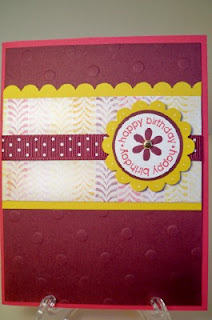 I got my Demo sneek peek order and thought I'd use the new In Colors with the new Circle Circus stamp set. I just love the new polka dot grosgrain ribbon too. The new In Colors aren't my favorite but I'll give them time to grow on me. The new catalog is out July 1st! Some fun stuff.